Board games were very popular in the 1950s. Electronics hadn’t completely taken over yet and there are many board games that came out in the 1950s that we still play today. Instead of plopping down in front of the TV, families would plan entire evenings around board games. “Family Board Game Night” wasn’t a joke, it was what people did for fun. Let’s break down board games from the 1950s from year to year, shall we? Games in 1957 tended to be family affairs. A record number of board games were introduced. They were scientiﬁcally planned to encourage primary-grade youngsters, teenagers, and adults to join together for competitive fun. Another strong trend was the slanting of game play toward mastery of the three Rs (readin’ writin’ and ‘rithmatic), history, and geography. The ﬁrst commercial game basing play on a phonograph record was introduced. 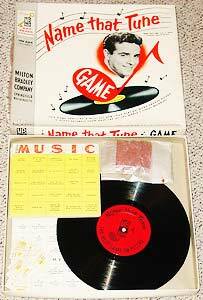 This game by Milton Bradley contains an LP record with excerpts from 160 of the world’s most famous melodies. Players are given boards similar to those used in bingo. The ﬁrst player to recognize and cover the names of ﬁve tunes in a row wins. New in games that aid education was Steps to Learning, an integrated series of games keyed to teach preschool and primary-grade youngsters basic understanding of shapes and forms, clocks, calendars, and arithmetic. Go to the Head of the Class, featuring three levels of quiz questions, was another popular family game. An indoor version of a childhood pastime Take a Giant Step, in disfavor outdoors because of trafﬁc hazards, was introduced. The game board was marked into steps of various sizes for competition keyed to interest all age groups. What about, sling shots, Yo Yo’s, rubber guns, skate boards, hop scotch, and the game MONOPOLY !!! What about Cootie. Every family had a Cootie game.